Two high-rise 22 story towers Grove at Grand Bay in Coconut Grove bring the new meaning of luxury to waterfront living. Built on the grounds of the old Grand Bay Hotel, the iconic high rise towers designed by the Bjarke Ingels Group in collaboration with Nichols Broch and Associates feature amazing Biscayne Bay Views. Located on three and a half acres of prime land in the popular Coconut Grove, Miami 33133 to the south of Downtown Miami. 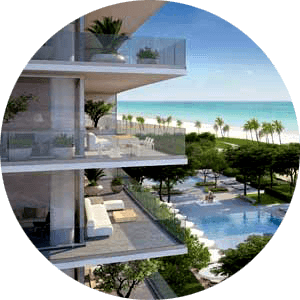 Please Contact Us or give us a CALL 786-505-4786 if you have a question about the Grove at Grand Bay Condos at 2669 and 2675 S Bayshore Drive. Spacious 95 residences in total, developed by Terra Group, feature amazing Miami Skyline and Biscayne Bay view and east facing terraces. The North Tower 2669 S Bayshore Dr with spacious 58 condo units offers spacious two, three, four and five bedrooms, while the South Tower at 2675 S Bayshore Dr only has 37 condos it total. Close proximity to areas fine restaurants, cafe, and shopping, just across the street from the Ritz-Carlton Coconut Grove. With other luxury condos in the area like the Grove Hill, Yacht Harbour, and Fairchild it is easy to see why Grove at Grand Bay residences are so desirable. At 18 feet above the sea level, the Grove at Grand Bay Residences features a grand lobby with 20-foot ceilings and buildings amenities located above that. Every residence in the Grand Bay complex offers breathtaking views of the tropical gardens, city, and waterfront. 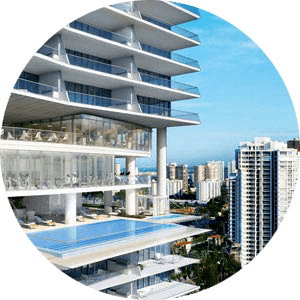 The first level residences are located at about the 50 feet above ground, clearing any obstructions for some of the best views in Coconut Grove. An Architectural masterpiece, Grove at Grand Bay condo was designed by Bjarke Ingles. Breathtaking, unobstructed panoramic views of the Biscayne Bay and Miami Skylines are just some of the luxury feature one would find in this resort lifestyle residences. One of the Best location in the Coconut Grove, close proximity to area schools, 5 pools, 3.5 acres of a lush landscape, top of the line concierge and butler, on-site restaurants, gym and private cycling studio. Few other features that are unique to the Grove at Grand Bay residences are the private airconditioned garage for penthouse units, staff quarters, an12-foot deep terraces. Spacious residences offer something for everyone, with a two-bedroom condo having over 1200 square feet of living space to a luxury Penthouse with over 10000 square feet of luxury living. Gas cooking for the indoor kitchen with outside kitchens on the balcony. With all of these amenities, it is easy to see what makes Grove at Grand Bay condo so unique and desirable place to call home.